A PhD in Public Affairs? 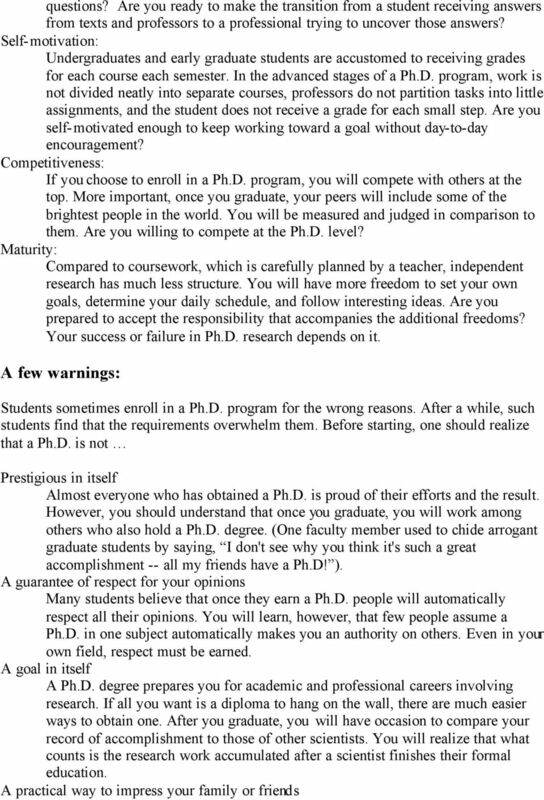 Download "A PhD in Public Affairs?" 1 A PhD in Public Affairs? The Basics A Doctor of Philosophy degree, abbreviated Ph.D. for the Latin Philosophiae Doctor, is an advanced academic degree earned in many fields, signifying major interests and accomplishments in research. Because earning a Ph.D. requires extended study and intense intellectual effort, less than one percent of the population attains the degree. To earn a Ph.D., one must accomplish two things. First, one must master a specific subject thoroughly. Second, one must contribute to the state of knowledge about that subject. One may think of earning a Ph.D. as gaining the capabilities and the self-concept of a self-sufficient, independent seeker for truth. Mastering A Subject Mastering a subject requires reading exhaustively in an area and consulting with gifted teachers, mentors, and experts. Academic books capture the accumulating scholarly knowledge and wisdom in a subject area. Journal articles contain the results of more current research. The most current work is exchanged more informally in scholarly person-to-person networks. Mastering a subject area requires extensive investigation and familiarity with all three of these repositories of knowledge. Each university establishes general guidelines that a student must follow to earn a Ph.D. degree, and each college or department within a university sets specific standards by which it measures mastery of a subject. 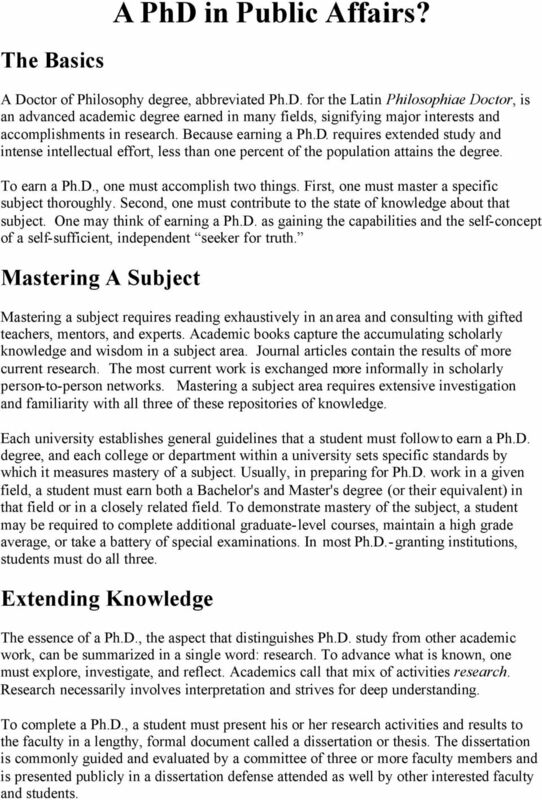 Usually, in preparing for Ph.D. work in a given field, a student must earn both a Bachelor's and Master's degree (or their equivalent) in that field or in a closely related field. To demonstrate mastery of the subject, a student may be required to complete additional graduate-level courses, maintain a high grade average, or take a battery of special examinations. 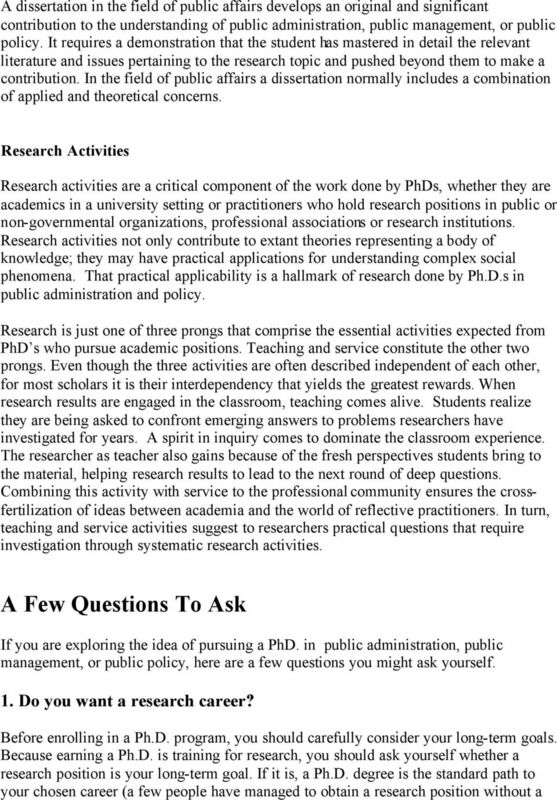 In most Ph.D.-granting institutions, students must do all three. Extending Knowledge The essence of a Ph.D., the aspect that distinguishes Ph.D. study from other academic work, can be summarized in a single word: research. To advance what is known, one must explore, investigate, and reflect. Academics call that mix of activities research. Research necessarily involves interpretation and strives for deep understanding. To complete a Ph.D., a student must present his or her research activities and results to the faculty in a lengthy, formal document called a dissertation or thesis. The dissertation is commonly guided and evaluated by a committee of three or more faculty members and is presented publicly in a dissertation defense attended as well by other interested faculty and students. 5 Your mother may be proud and excited when you enroll in a Ph.D. program. After all, she imagines that she will soon be able to brag about her child, the doctor. However, a desire to impress others is insufficient motivation for the effort required. Something you can try to find out how smart you are Sorry, but it just doesn't work that way. Unless you make a total commitment, you will fail. You will need to work long hours, face disappointments, stretch your mental capabilities, and learn to find order among apparently chaotic facts. 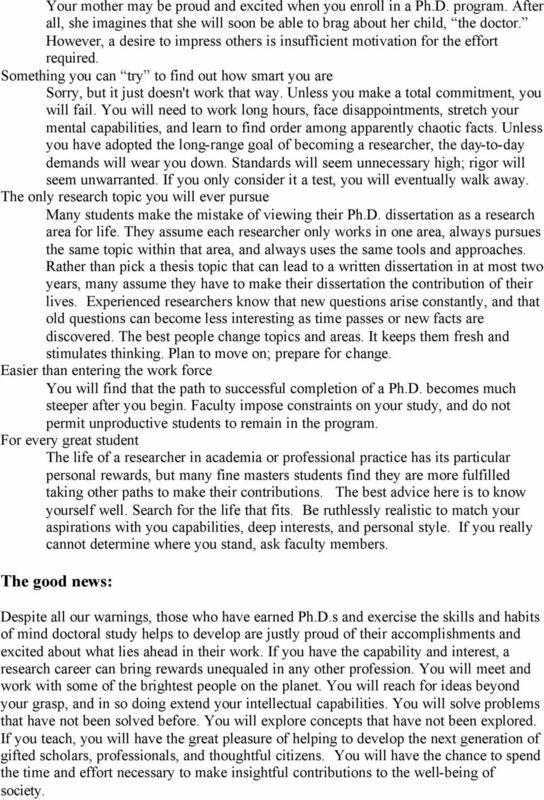 Unless you have adopted the long-range goal of becoming a researcher, the day-to-day demands will wear you down. Standards will seem unnecessary high; rigor will seem unwarranted. If you only consider it a test, you will eventually walk away. The only research topic you will ever pursue Many students make the mistake of viewing their Ph.D. dissertation as a research area for life. They assume each researcher only works in one area, always pursues the same topic within that area, and always uses the same tools and approaches. Rather than pick a thesis topic that can lead to a written dissertation in at most two years, many assume they have to make their dissertation the contribution of their lives. Experienced researchers know that new questions arise constantly, and that old questions can become less interesting as time passes or new facts are discovered. The best people change topics and areas. It keeps them fresh and stimulates thinking. Plan to move on; prepare for change. Easier than entering the work force You will find that the path to successful completion of a Ph.D. becomes much steeper after you begin. Faculty impose constraints on your study, and do not permit unproductive students to remain in the program. For every great student The life of a researcher in academia or professional practice has its particular personal rewards, but many fine masters students find they are more fulfilled taking other paths to make their contributions. The best advice here is to know yourself well. Search for the life that fits. Be ruthlessly realistic to match your aspirations with you capabilities, deep interests, and personal style. If you really cannot determine where you stand, ask faculty members. The good news: Despite all our warnings, those who have earned Ph.D.s and exercise the skills and habits of mind doctoral study helps to develop are justly proud of their accomplishments and excited about what lies ahead in their work. If you have the capability and interest, a research career can bring rewards unequaled in any other profession. You will meet and work with some of the brightest people on the planet. You will reach for ideas beyond your grasp, and in so doing extend your intellectual capabilities. You will solve problems that have not been solved before. You will explore concepts that have not been explored. If you teach, you will have the great pleasure of helping to develop the next generation of gifted scholars, professionals, and thoughtful citizens. You will have the chance to spend the time and effort necessary to make insightful contributions to the well-being of society. 6 Original source: Douglas Comer, Distinguished Professor of Computer Science, Purdue University. Adapted with permission by NASPAA Doctoral Committee, September 2007. Thinking of Applying to Graduate School in Environmental Science? Thinking of Applying to Graduate School in Environmental Science? In many environmental science fields obtaining a graduate degree will increase your range of employment options or improve your earnings. 41% of respondents were confident or very confident that the major they currently are planning to pursue would be the right major for them. Letter from the Editor-in-Chief: What Makes an Excellent Professor? If you d prefer to receive an application via mail, contact us at 209.946.2558. What does student success mean to you? imentor s College Transition Program ensures students successfully transition to and persist in college by matching them with mentors for three years, from 11th grade through the first year of college. Applying and Interviewing for Graduate School Intelligently!! 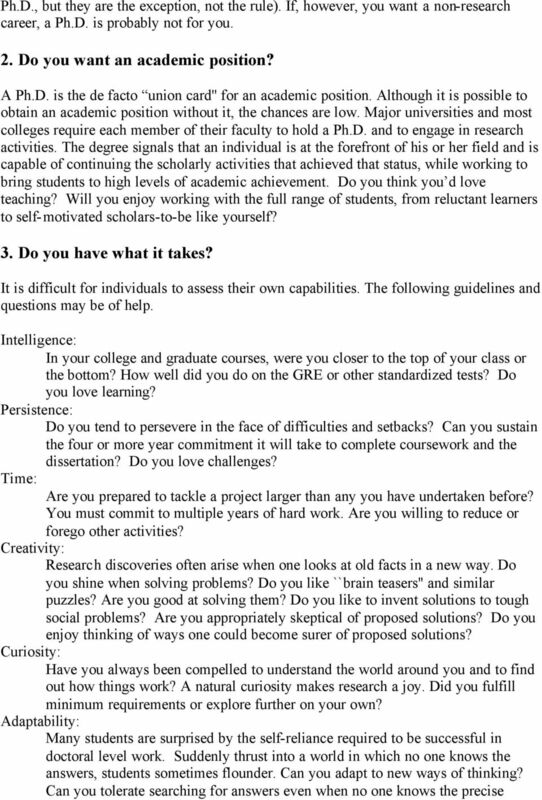 Graduate school: Is it for me? SME Graduate School Sustainable Managing Entrepreneurs Fast-Track Ph.D.
Is a Graduate Degree in Your Future? June 2014 Master of Public Administration at Upper Iowa University 1 Academic or Professional Master's Degrees: Does it Matter? Yes! The UIU MPA program combines both an academic and a professional focus. APPLICATION GUIDE TO GRADUATE SCHOOL IN PHILOSOPHY Section 1: Preparing for Graduate Study in Philosophy 1 Graduate school in philosophy is the natural option for many undergraduate majors in philosophy. Graduate School - An Overview A graduate education can be an important part of a career in science and many CALS students consider attending graduate school after completing their undergraduate degrees. Cutting to the chase What do you need to get accepted to an economics PhD program? Karlstad University Faculty of Social and Life Sciences Curriculum for Doctoral Studies in Social Work Approved by the Faculty Board of Social and Life Sciences on 28 August 2008 (Reg.no. FAK3 2008/155). Tough Interview Questions and Answers by Candace Davies Equipped with a stunning resume, you are ready to secure that perfect teaching position. Now it is time for the next step: the dreaded interview.